From seats in Section 6, Row 7 it was a great show last night in San Francisco. At SBC, it was no problem to move from the front sections to the small stage and get a good view, with plenty of room to dance. As an added bonus, you could buy an Anchor Steam from vendors set up in the Giants' dugout on the way back to your seats! The set list included the mini Exile grouping. The overall highlights were Sympathy (two great Keef solos), Paint it Black, All Down the Line and Sweet Virginia, which was introduced by Mick thusly, "We're gonna do some country for ya." The presumed advances in technology have made the sound MUCH better than on past tours, and Mick's vocals were awesome throughout, as highlighted in Joel Selvin's review this morning in the SF Chronicle. During the introductions it was Ronnie "Rembrandt" Woods and Charlie "Wang Dang Doodle" Watts. It was great to see the boys from close range, especially when Mick would deposit his mike in the stand at the end of the runway and give us some moves. Look forward to seeing them again in three years, if not sooner. Tonight was my chance in a lifetime to be part of the Onstage experience that the Rolling Stones are offering at their stadium shows. I have read some pro and con reviews from other people who had Onstage access, so I was concerned about many aspects of it. Other reviews claimed about the confusion of getting the passes to the special entrance, the inconvenient process of having to be escorted to use the restroom, the obstructed view in certain sections, so forth and so on�� Well I�m here to tell you that in spite of these minor issues, there is nothing more exciting for a true Rolling Stones fan than to be able to see and feel what it is like at a Rolling Stones show from the perspective of being �behind the band.� I was able to get an up close view of many of the things that happen onstage with all of the performers, that in the past I would have to strain to see what was going on. As many of you know, when watching the Stones perform there is so much happening at once. It is hard to focus on any one person too long. The bird�s eye view allowed for a broader scope so I was able to catch much more of the action. Among many new observations that I made while I stood atop the stage looking down at the Stones and the sea of many thousands of joyous fans, was I figured out why the Stones continue to perform their warhorse songs at every concert. These songs not only rock out and please the majority but they are perfect songs for the Stones to extend at the end of the setlist and really give it their all for one last time of the night. As many times that I have heard songs like Brown Sugar and Jumping Jack Flash, it never fails, each time that I see them played live I am still bouncing all over the place with a major smile on my face. Ain�t no doubt about it��..Life is beautiful when the Rolling Stones are here! We decided to drive up from Santa Cruz early and stuff the car in one of the ball park lots at 4pm and hang out downtown SF and cab it back. I had just gotten out of the car, and heard an ENORMOUS big dirty explosion of Live Sound. It seemed like live music, and I was about a quarter mile from the stadium. Could that be the Stones or just a Stones song on the PA???? Clearly we could hear Mick singing over this sound. I couldn't believe they were doing a sound check, and they went through a full 4-5 songs in broad daylight. We walked over to the stadium, and the bay was flat and glassy, boats were tying up in McCovey Cove.....and there is a hole in the right field wall where you can watch baseball games without paying. About 50 people were there with a clear view of Mick strumming a guitar and the band kidding around, but playing 5-6 entire songs in row. The big monitor also recorded the sound check, and you could also view that from the 3rd Avenue bridge. What a treat!! For me the best came when they delivered up Sweet Virginia (it was in the sound check). Thank you for your wine, California, Thank you for your sweet and bitter fruits. A great show, the place was rocking, an amaxing clear and warm evening in the ball park. Keith mumbling: "It's great to be here" and then "It's great to be ANYWHERE!" Energy? Jagger could probably run a sub 2:30 marathon! It is the next morning and I�m still pretty much in a state of shock right now but I�ll try to write down what I saw last night as best I can. But to go back a little, show day dawned perfect and the forecast looked good all day � 70 degrees and clear. I was very excited in the day before and morning of the concert thinking of what was going to happen and everything that could go wrong to keep me from getting there. I had tried to think of everything � treating the concert like a trip into outer space. I had rarely felt this much anticipation for anything. Even before I left on the 90-mile drive to SBC Park I made it one of my goals to keep from getting overly excited. When driving down I could not help but think this was a rare day. 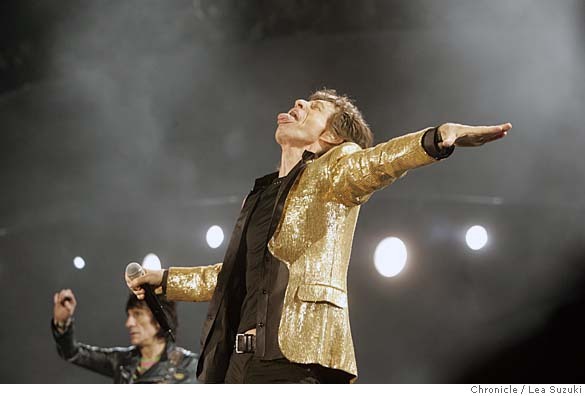 How often are you headed towards seeing The Rolling Stones? Just a few times in your life and this was one of them. The Freeways in S.F. are tricky but there was no substantial backup at the Bay Bridge tollgate. Parking is a big problem around that Park on a regular basis but especially now that they are doing roadwork to the bridge approaches. I chose a parking lot to make sure I could get away from the immediate jumble outside the stadium after the show. I must have picked the right one because directly behind me were the Rolling Stones trucks � acres of them -- including many class a type motor homes, transport vehicles, cranes and cars. Looked they had about as much stuff as at a NASCAR race, including the teams. Absolutely amazing. I began walking to the Stadium and when getting closer I could hear a Stone song. It was "All Down The Line", a live version, and had never heard it and it sounded great. As I got closer I realized it was Stones themselves doing a sound check! I walked near the back of the stadium in back of left field to get some better sound and all of sudden found myself near the official rear gate. During the sound check they did All Down the Line, Rain Fall Down and Sweet Virginia. The activity near the rear gate was pretty fascinating with tons of interesting people walking around, security type people, guys in suits, cops, limos. etc. etc. It is amazing how much activity the Stones generate. After listening to the sound check I could tell it was more than a sound check � pretty much a warm up and final practice. And then hold onto it. I found out they just don�t walk out and do these shows cold. After arriving at the Willie Mays gate I was ready to rename it Mick Jagger Gate and Rolling Stone Stadium. Security took a while but after about 30 minutes it really picked up speed and made people a lot happier. So under an almost full moon and the planet Mars the show got underway with Everclear which I thought was the opening act for Tuesday�s show and Metallica. There were a surprising number of Metallica fans in the crowd. I had never heard them before but if you like heavy metal I guess they are the quintessential group and great if you like that kind of thing. Finally Metallica finished up and The Stones people got to work changing the stage. I finally saw the person who writes the set list on Charlie�s Plexiglas and she was writing it up until the last minute. Been curious about that. Good handwriting and after writing down the songs she carefully checked each list with her paper. Guess she�d better get it right. Then came the grand entrance of the fans with seats on stage. Quite an interesting group I might add. Then there was just the stage. As the Stones burst onto the scene the first thought that flashed in my mind was I had been watching those DVD�s too long. My god, what an awesome, overwhelming scene in size, sound, color and emotion. You could tell right away this was going to be an edge of your seat event. My first favorite of the night was Tumbling Dice. Thought they did it justice. Shortly thereafter Mick said he had met with the Mayor of San Francisco. I must not have heard what he really said so I won�t put it down here. There have been these stories about Mick�s girlfriend calling for the Stones to dress better on stage. I�ve never had a problem with it but I see Charlie was wearing a pretty orange golf shirt instead of his regular blue golf shirt so they must be listening. The sound was very good -- clear and precise -- but on the loud side and did vary from song to song. But my favorite song of the night changed when they did Rain Fall Down. It was much better than the sound check version (surprise, surprise) and really got the crowd going! Nighttime is the Right Time was all it was said to be in past reviews. Lisa could be a famous singer worldwide on her own. What a voice and the only person who doesn�t take any ribbing from Jagger and gets away with giving it right back. Those two have great, great chemistry. The only "mistake" of the evening that I saw is that I thought Mick introduced Bernard Fowler and "Fowler Bernard". But maybe I was starting to lose it about that time. Jagger introduced Ron as Ronnie "Rembrandt" Wood obviously for his artworks. When Keith came up for his numbers he said some things but I will not write down because I�m not sure I heard them right. On the new album, Infamy is really not that dazzling but when he sang it last night it absolutely came alive. Fabulous song indeed. Then, when the stage started to move out onto the field like some kind of a boat across the sea, all hell broke loose. Mick said they were going to play one he hoped we would remember. He�s always saying he wonders if they�ll remember it and this time he turned the tables on us. But we all remembered it and the crowd went crazy getting into Get Off Of My Cloud. By this time nobody was left sitting down and it pretty much remained that way for the rest of the concert which turned into a blur of lights, sounds, screaming and fireworks. And speaking of lights and fire, Sympathy for the Devil definitely had more red lights and fire than any version I have ever seen � ever, ever, ever. I didn�t see anybody leave early but if they did I wouldn�t blame them. By the time the encore came around most sane people would have had all the excitement they could reasonably handle for one day. At the end I watched Mick disappear out of site behind the stage. When I got outside the stadium there were still thousands of people screaming for them to return but down the street the Stones were already leaving in the motorcade. I will be taking in the Fresno Show next Sunday and will see how that compares. The way I would sum up this show is -- stage overwhelming, people overwhelming, Stones totally overwhelming. The name of this tour is called A Bigger Bang and that is precisely what the Stones did last night � performed the most bang up concert I�ve ever seen. I�ve gone to every local Stones concerts since �81 and this show is the tightest yet. The boys seem to age like fine wine. Mick was mean and lean and of course ran all night long. The whole band just cooked and the set and show was spectacular. It seemed smaller than other shows and the whole event had an almost intimate feel if that is possible in a stadium. Sweet Virginia, Paint It Black, Get Off My Cloud were my favorites that you don�t hear much. When Mick started wailin� on Night Time is the Right Time � the evening clicked in to high gear. Great show � you gotta go. Like a fine merlot � these old bastards got legs! The boys came out last night and put on a very fine show indeed. From the opening licks of Start Me Up through the last flourish on JJF Keith and Mick showed why they continue to front the Greastest Show on Earth. The band showed some cracks in the facade last night- laboring through some songs, working hard to crank it out and keep the crowd howling- they seemed just a bit older and a bit more vulnerable- Mick was not his usual EveryReady Bunny self, but rather really focussed on the quality of his lyrics and sang the best I have ever seen him, in 24 shows spanning 4 decades. Sweet Virgina continues to echo through the San Francisco sun this morning- see you all Tuesday! Sunday's show woke me up to the rocking/grooving tracks on the new album, " A Bigger Bang." Rain Fall Down had people swaying in the aisles. Oh No Not You Again and Infamy had blistering guitar solos by Keith. But the image that is burned into my soul is Pastor Mick dressed in a floor length white coat leading his flock with You Can't Always Get What You Want. What an encore !! Amen !! What a great great show. We flew all the way over for a long weekend in San Francisco, and this show didn't disappoint. We managed to get some great seats, 8 rows from the main stage, right next to the centre aisle. I could go on for ages, but, i'll just try and keep it short. I love the stage, great intro, that fire was hot! Start me up is a predictable opener, but it sounded great. Keiths guitar was loud and dirty, and Mick runs out, absolutely on form. Ronnie seemed to be in good shape tonight, after his solos on SMU and YGMR. I was a bit disappointed that we got 'Live with me'. They seem to play this alot when i see them! My girlfriend is a casual stones fan and she loves "She's so cold", as do I, and I had told her how they are playing it a lot on this tour, and then... We don't here it! Night time... was absolutely stunning, just a great rendition with Lisa being amazing, then with Mick 'dancing' and fondling her at the end. Enjoyed Keiths set, as did the girlfriend (Well done girl!). It was great to hear sweet virginia. The whole show really was great, this was my 10th Stones show since 1995, and I can honestly say that the band were as good, if not better, than ever, and Mick still has TONS of energy, running from left to right. It was awesome. My partner was totally impressed and said it was easily in her Top 5 gigs of all time. I just can't believe they can still deliver a show like this. Just stunning. Now I am back home in London, jet-lagged, wishing I was going to the Tuesday show (tonight), where I KNOW they will play She's so cold!!!! Looking forward to the Europe shows next year! Andy Knight a.k.a : Mr. Jimmy. The leading San Francisco newspaper "San Francisco Chronicle" have a front page feature with a great picture of Mick, with Ronnie in the background. Headline on the front of the page: "Tongues wag for Stones at SBC Park". Headline of the story: "Stones Deliver With A Bang". See picture above. Chronicle senior pop music critic Joel Selvin is writing a great report with many fine detals. Being impressed with the entire band, he have some special quotes regarding Mick. See quotes to follow, and use the link below for the full story! His vocal performance instantly lifted the band to levels the Rolling Stones have only briefly visited in recent years. He can do this as long as he wants. It was a perfect evening, a light breeze coming off the bay, almost a full moon. Smiles lips and tongues everywhere. Metallica came on and rocked the house. I have not seen them since the Monsters of Rock tour in 88. They did well. They did not do any of the tracks from the St. Anger album thank god. After a visual on the big screen, some fireworks, Keef's blistering riff of Start me up cleared the smoke, The boy's were there for business and you could tell. Mr. Jagger's voice was commanding and powerful, clear and loud as were both guitars. They did a few numbers from the new album along with the war horses we expect. We even got a little Sweet Virginia. Keef said his predictable "how ya been OK?' "Good to be here, good to be anywhere" Jagger kept the energy going for a solid two hours and it looked liked he was very much in control and could have probably danced all night......as usual. The crowd was going crazy when a portion of the stage went into the middle of the park with the boys doing a great Miss You. Back to the main stage with the familiar percussion of Sympathy, they ran thru an evil rendition with the help of 40 thousand people doing the woo-hoo's, Wrapping up with Jumping Jack Flash. It all went by so fast as it usually does. I'm sure everyone including the band was Satisfied! As they should be.